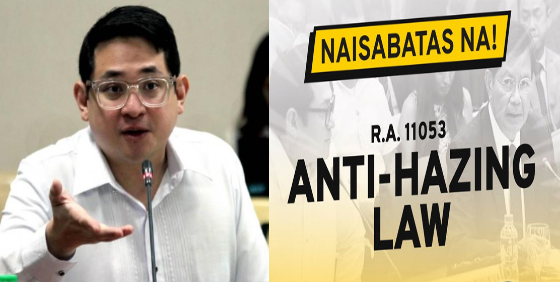 Netizens twit on Senator Paolo Benigno “Bam” Aquino IV for credit – grabbing the Anti – Hazing Law of 2018 which was recently signed into law Republic Act 11053 by President Rodrigo Duterte, months after the death of University of Santo Tomas Civil Law student Horacio Castillo, the latest confirmed victim of such abuse. Twitter users called out Aquino for posting a meme in his tweet last Wednesday, claiming co – authorship of the said law which denotes a brief laudatory remark to Senator Panfilo “Ping” Lacson, who sponsored the bill in the Senate, however, spelling out the latter’s name WRONG. The meme had a yellow background – symbolizing Aquino’s political color along with a guarantee stamp that boasts Aquino’s legislative productivity saying, “24 Laws Passed in 5 Years”. A Netizen named Brojan Shawie (@BrojanShawie) boldly called out Aquino’s misdemeanor and rectified that Senator Sherwin Gatchalian, Senate Majority Leader Juan Miguel Zubiri, along with Lacson were the legitimate authors of the bill. 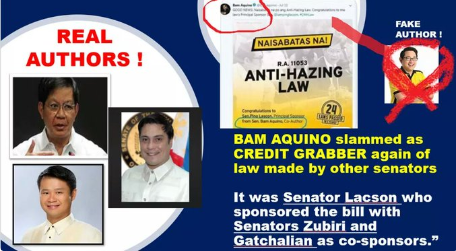 In his tweet, Shawie posted, “BAM AQUINO slammed as CREDIT GRABBER again of law made by other senators… It was Senator Lacson who sponsored the bill which Senators Zubiri and Gatchalian as co-sponsors”. Followed by another tweet intended to belittle Aquino, saying, “Kapal ng mukha mo! Umattend ka lang ng lamay ng hazing victim co-author ka na. Wahhahahaha. #LandGrabber na nga kayo, #CreditGrabber pa! Di ka mananalo sa sunod na election. We will see to it!”. Bawie’s claim was justified by another Twitter user named deus ex machina (@deusexmachina15) when the latter managed to recover an old Manila Bulletin issue that denoted, “It was Senator Panfilo “Ping” Lacson who sponsored the bill with Senators Juan Miguel “Migz” Zubiri and Sherwin Gatchalian as co – sponsors.” – as posted on Twitter. 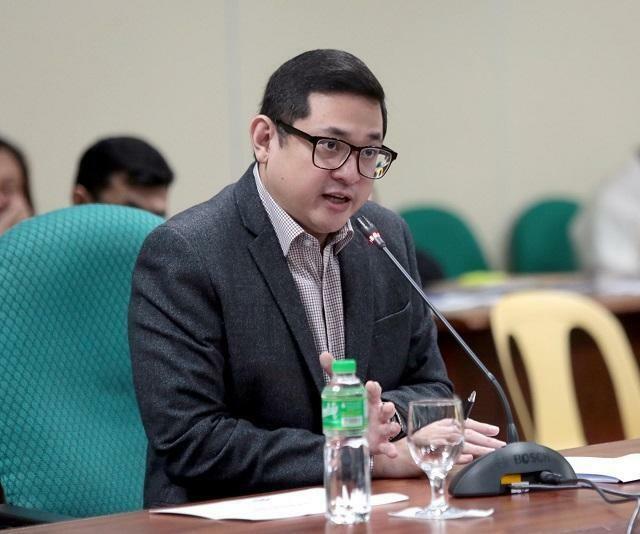 This is the 2nd known instance that Bam Aquino was referred to as a ‘credit – grabber’ since claiming credit for free tuition in state colleges and universities in 2017, which prompted Senator Ping Lacson to realign the P8.3 Billion supposedly allotted for the Department of Public Works and Highways’ project to cover for the students’ tuition, instead.